DARPA Grand Challenge, Google, Ot.to, Uber, Gerichtsfall and not Pronto.AI. That’s the short version of Anthony Levandowski’s career. And he is only 38 years old. His influence in the space of self-driving cars, which started with a self-driving motorbike in 2007 at the DARPA Urban Grand Challenge, expanded over the years to larger vehicles. And starting today ‘Mr. LiDAR’ is back in the scene with a new startup. Pronto.AI is focusing in the first steps on the development of autonomous trucks, or more precisely, the development of an after-sales kit to allow trucks autonomous driving. For the launch the company published a video demonstrating a truck driving with this retrofit kit. In a defiant and pugnacious blog post Levandowski talks about the company’s goals. In a first step the company is not aiming to reach Level 4 or Level 5 autonomy, but offer an enhanced driving assist system for trucks and semis. Under the name Copilot a system similar to those used in high-end cars shall be offered for 5,000 dollars. The startup is using six cameras that deliver the visual information and an AI system makes sense of that. A seventh camera is inside the car watching the driver to make sure he stays attentive. Interesting though is the fact that Pronto.AI does currently not use LiDARs, and that’s despite Levandowski’s history. His contribution as lead engineer for developing LiDARs also brought him into all the troubles that contributed to his firing at Uber, the lawsuit that Waymo filed against Uber, and the closure of the trucking division at Uber. But other companies such as Embark are also using the cameras-only/first approach. Pronto.AI is joining a series of other startups developing self-driving trucks, driving assist systems or platooning for trucks. 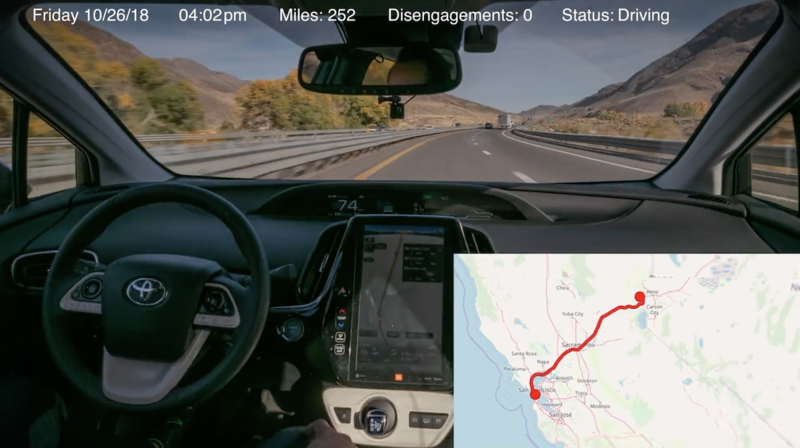 A newly published video shows a Pronto.AI equipped truck driving 3,099 miles (5,000 kilometers) from San Francisco to New York. The drive took place on October 26th, 2018 and was exclusively on highways without the interference of the safety driver. The video reminds us of the one that Ot.to – co-founded by Levandowski – from October 2018. And yes: currently Pronto.AI is not listed among the companies who got a California test license. That already brought Uber’s Advanced Technology Group under Levandowski’s leadership into troubles. As Levandowski writes in his blog post: “Yes, I am back!” and he hasn’t changed at all. For good and for worse.